Compsognathus is an interesting find for it was the very first complete dinosaur every found (only the very tip of the tail was missing), no other dinosaur before could claim a better fossil than Compsognathus. What is very perplexing to notice is the way in which he died, based on the fossil. The head of this rather small dinosaur was quite large and contained many, sharp, curved teeth. These teeth ripped at flesh or caught them in a fast hold. It does not seem that the teeth could be of much use taking down herbivores so Compsognathus probably ate smaller lizards or mammals. The jaws also back-up this point as they are slender and not capable of pulling off such a feat as killing large animals. As is common with these smaller, more unprotected dinosaurs, the legs are built for speed. 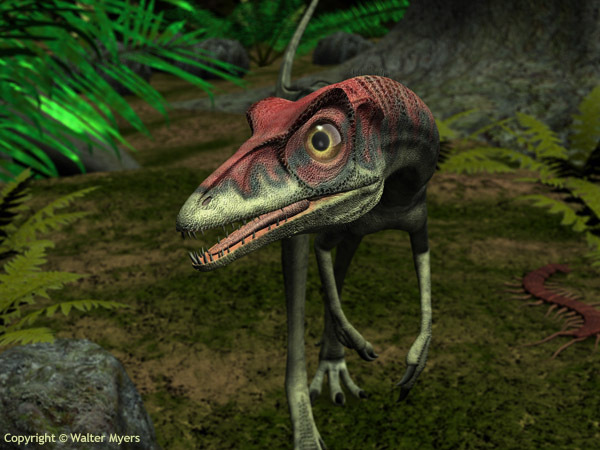 The limbs are hollow and, like Coelophysis, they give it one extra advantage against predators, more agility and speed. Even though the feet were clawed these claws were probably used for nothing else except better traction. If his prey decided to pursued up a rocky slope than Compsognathus would follow, bearing his feet into the rocks (probably spreading his toes out too) and grasping with, what would be considered our toes. Skeletal remains of a lizard were found in the stomach of Compsognathus. This lizard was identified as a Bavarisaurus and seems to have been swallowed whole by the hungry predator. That poor lizard didn’t have a chance either way though, if he escaped the agile dinosaur he still would have been wiped out by the flood that killed his eater. Although there was no evidence for feathers many drawings put what many consider “proto-feathers” covering the beast. This is neither accurate nor scientific. Actually, Compsognathus was an interesting find in that it is a saurischian that was an “ancestor” to modern birds. What turned this all around was the fact that the feather-less (and proto-feather-less) dinosaur was found in the same layer as Archaeopteryx. If a fully-flight-worthy bird was found in the same area with a dinosaur that was its ancestor (yet had zero feathers) than how can the evolutionists explain the transition? 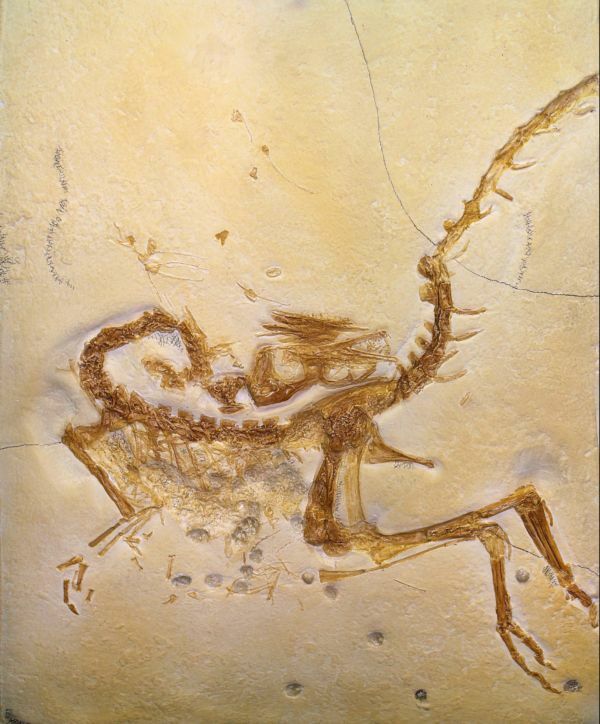 Here is a perfect dinosaur fossil that should have preserved feathers or “proto-feathers” and yet it contained none. Normally when an animal dies, and if it gets buried and fossilizes, it would look normal. However, many, many dinosaur fossils (and many other fossils) have a strange pose referred to as the “death pose”. This pose has the neck bent so far back that sometimes it almost touches its own back with the top of the head. Evolutionists have since come up with ways this could happen and their favorite is when the animal died its neck muscles tighten up and pull the neck way back. But, this doesn’t make sense because they have left chickens out, after they died of course, and their necks did nothing. Even with this evolutionists still believe that Compsognathus died by a lake and the lake covered him up. This doesn’t make up for the death pose. Instead I propose a new theory for the evolutionists. When the global flood hit 4,000+ years ago it carried huge amounts of sediment that would have slammed into the dead or soon-to-be-dead Compsognathus. The sediment forced the neck of the beast as far back as it could go and the sediment quickly settled. Since Compsognathus had been hit so hard his neck settled back against his back (with the help of cold, marine water, which is known to do similar death poses in chickens). With all the pressure and sediment surrounding him his neck couldn’t have moved, making the death pose final. The sediment became stone and preserved the fossil. As can be seen again, the global flood accounts for many more than all the other theories. Compsognathus, like many other dinosaurs tell us of both the loving Creator God and the justice He had to bring out on all of Creation.